103. The embryo. The plant in its earliest stage of life is an embryo, contained in a seed. It then consists essentially of two parts, the radicle and the plumule. We may discern both in many seeds, as the pea, bean, acorn. 104. Growth of the embryo. After the seed begins to grow or germinate, the embryo extends itself in two directions, to form the axis of the plant. The radicle or root-end grows downward, penetrating the dark damp earth as if to avoid the light, and forms the root or descending axis. The plumule, taking the opposite direction, ascends, seeking the light, and expanding itself as much as possible to the influence of the atmosphere. This constitutes the stem or ascending axis, bearing the leaves. 105. Growth of the terminal bud. first the ascending axis is merely a bud, that is, a growing point, clothed and protected by little scales, the rudimentary leaves. As the growing point advances, and its lower scales gradually expand into leaves, new scales successively appear above. Thus the axis is always terminated by a bud. 106. Axillary buds. By the growth of the terminal bud the axis is simply lengthened in one direction, an undivided stem. But besides this, buds also exist, ready formed, in the axils of the leaves, one in each. 107. How branches are formed. These axillary buds, a part or all of them, may grow and develop like the terminal bud, or they may always sleep, as in the simple-stemmed mullein or palm. But in growing they become branches, and these branches may, in turn, generate buds and branchlets in the axils of their own leaves in like manner. Acorn (seed of Querent palus tris)germinating; 6, section show, ing the radicle (r) which is to become the root, and the two cotyledons (c) which are to nourish it; 7, the radicle r, descending; 8 and 9, the radicle, r, descending, and the plumule (p) ascending. 108. By the continual repetition of this simple process the vegetable fabric arises, ever advancing in the direction of all its growing points, clothing itself with leaves as it advances, and enlarging the diameter of its axis, until it reaches the limit of existence assigned by its Creator. 109. The organs of nutrition. Reared by this process alone the plant consists of such organs only as were designed for its own individual nourishment - roots to absorb its food, stem and branches to transmit it, and leaves to digest it. These are called organs of nutrition. But the divine command which caused the tribes of vegetation in their diversified beauty to spring from the earth, required that each plant should have its " seed within itself" for the perpetuation of its kind. 110. How the flower originates. In the third stage of vegetation, therefore, a change occurs in the development of some of the buds. The growing point ceases to advance as hitherto, expands its leaves in crowded whorls, each successive whorl undergoing a gradual transformation departing from the original type, - the leaf. Thus, instead of a leafy branch, the ordinary progeny of the bud, a flower is the result. 111. Nature of the flower. A flower may be considered as a transformed branch, having the leaves crowded together by the non-development of the axis, moulded into more delicate structures, and tinged with more brilliant hues, not only to adorn the face of nature, but to fulfill the important office of reproduction. 10, Paeony, with some of its petals removed to show the stamens and pistils. 11 to 22, the organs, graduated from the leaf to the pistil. 113. A view of the organs of the PAEONY, for example. (r) The root with its numerous fibers and flbrillae (some fibers tuberous) continues the axis downward, and (s) the stem upward. The leaves (a) approaching the summit, gradually lose their characteristic divisions, and at length become simple bracts, (6) still undoubted leaves. Next by an easy gradation they appear as sepals (c, d, e,) in the calyx, the outer envelope of the flower, with stalk expanded and blade contracted. Then by a somewhat abrupt transition they pass into the delicate and highly colored petals of the corella (f, g,)t still retaining the essential marks of the leaf. 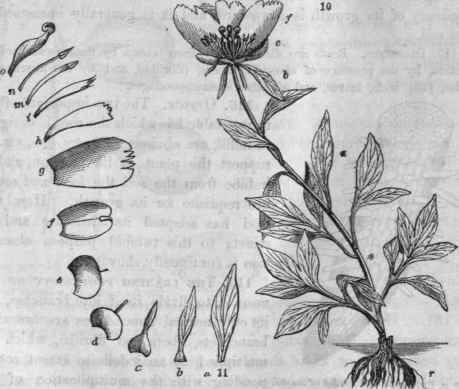 To the corolla next succeed those slender organs called stamens (m, n), known to be altered leaves from the fact of their being often converted into petals (i, h). Lastly the pistils (o,) destined to bear the seeds, two or more central organs green in color, are each the result of the infolding of a leaf, the mid-vein and united edges being yet discernible.